Issuing "Letter of Good Standing"
How to identify registered drugs or pharmaceutical products? Are there any control measures on pharmaceutical products containing animal-derived materials? Are cosmetic products advertisements require approval from Medicine Advertisement Board (MAB)? How to apply for Pharmacy Intranet account? We are pleased to invite the submission of abstract for oral and poster presentation in clinical pharmacy and pharmacy practice. 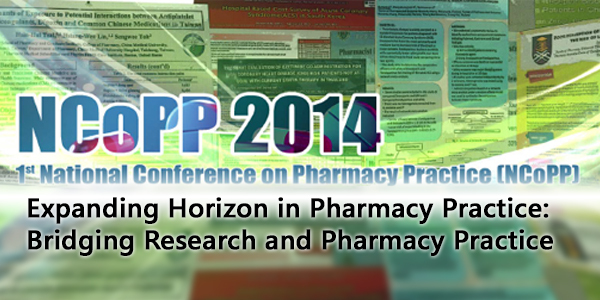 All accepted abstracts will be published in the Malaysia Journal of Pharmaceutical Sciences. Please refer to NCoPP website (website address) for abstract submission and registration details. -This workshop provides a forum for exchange and discussion of various aspects of qualitative research. -It will provide participants a basic understanding of qualitative methods, their theoretical foundations and their application to a range of research projects, particularly health research. -The workshop session is structured so that participants gain experience in doing and writing qualitative research. No any event at this moment. Disclaimer : Pharmaceutical Services Programme, Ministry of Health Malaysia shall not be liable for any loss or damage resulting from the use of information in this portal. Copyright © 1999 - 2019 MOH Pharmaceutical Services Programme. All Rights Reserved.